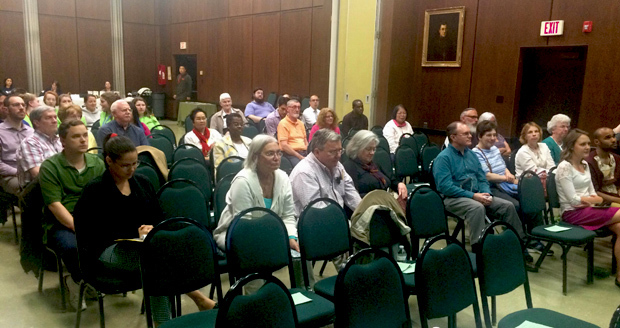 Guests at a talk on Pope Francis' vision for care of creation April 20 at the Archdiocesan Pastoral Center speak with representatives of the Aquinas Center, which cosponsored the evening reflection. 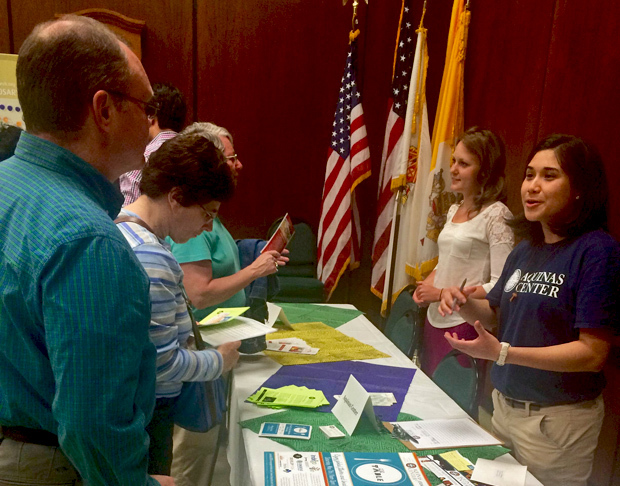 Earth Day came two days early, on the evening of April 20 at the Archdiocesan Pastoral Center in Philadelphia, as about 50 guests heard a pastoral reflection on “Laudato Si,” the ground-breaking encyclical written by Pope Francis on the environment. The principal speaker was Ricardo Simmonds, director of the University of Pennsylvania’s Newman Center, who not coincidentally has his master’s degree in environmental science. Simmonds has something else in common with Pope Francis, other than a concern for the environment. He too was born in South America, in his case in Brazil. And of course both have a high regard for St. Francis of Assisi — Pope Francis to the point that the encyclical’s opening phrase, “Laudato Si mi Signore, (Praise to you, my Lord)” was written not in classical Latin but the medieval Italian of St. Francis. “’Laudato Si’ is a moral and almost prophetic invitation for a change of heart and a change of culture,” said Simmonds. He believes the encyclical will be one of the most important documents Pope Francis will issue “especially because it is the first encyclical ever on the environment,” he said in an interview after his talk. 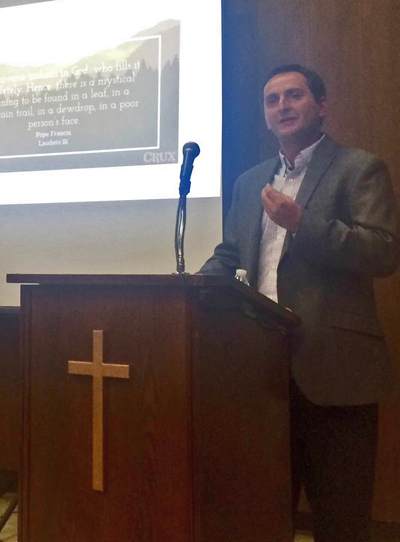 The event featuring his talk was cosponsored by the archdiocesan Office for the New Evangelization and Office for Pastoral Care of Migrants and Refugees, and the Aquinas Center in South Philadelphia. Self-examination followed by change has been a major feature in Simmonds’ own life. Raised in Sao Paolo, Simmonds’ father was from the United States, so Ricardo grew up speaking both Portuguese and English. After graduation from high school in 1999, he took a year off traveling the world in a journey of self-discovery. It took him mostly backpacking through India, Nepal, Bhutan, Thailand, Australia and the South Pacific. He immersed himself in Hinduism, Buddhism, new age spirituality and, for sport, he surfed a good deal in Australia and the South Pacific. He enjoyed all of his experiences and learned much, but somehow was not fulfilled. “I never came to the point where I thought I found everything I was looking for. It was always, ‘Well, what’s the next thing?’” he recalls. After this year-long fling he settled down to college, choosing Bowdoin College in Maine. It was during these years he rediscovered his Catholic roots, and most life-changing was leading a mission trip to Peru, working on a project in a small shanty town. He left Bowdoin in 2003 to work in Peru as a lay secular minister for the next three years. Because Creatio is headquartered in Colorado, Simmonds resumed his studies at the University of Colorado Boulder, where he obtained his M.S. Two years ago he was invited to come to Philadelphia to take the post of director at Penn’s Newman ministry, which is the oldest Newman Center in America, founded in 1893 as a gathering place for Catholic students attending secular colleges and universities. The Newman Centers are named for Blessed John Henry Newman, the great 19th-century English Catholic convert and apologist who taught at Oxford University. He believes “Evangelii Gaudium,” the apostolic exhortation issued by Pope Francis as well as his going out to the periphery, is very attractive to young people.